This NASA/ESA Hubble Space Telescope has given us this stunning view of the bright Alpha Centauri A (on the left) and Alpha Centauri B (on the right), shining like huge cosmic headlamps in the dark. The image was captured by the Wide-Field and Planetary Camera 2 (WFPC2). WFPC2 was Hubble's most used instrument for the first 13 years of the space telescope's life, being replaced in 2009 by Wide-Field Camera 3 (WFC3) during Servicing Mission 4. This portrait of Alpha Centauri was produced by observations carried out at optical and near-infrared wavelengths. Compared to the sun, Alpha Centauri A is of the same stellar type, G2, and slightly bigger, while Alpha Centauri B, a K1-type star, is slightly smaller. They orbit a common center of gravity once every 80 years, with a minimum distance of about 11 times the distance between Earth and the sun. 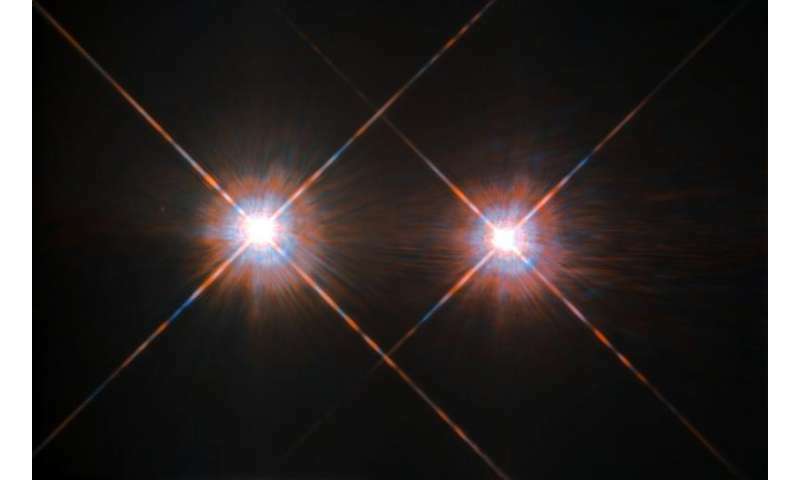 Because these two stars are, together with their sibling Proxima Centauri, the closest to Earth, they are among the best studied by astronomers. And they are also among the prime targets in the hunt for habitable exoplanets. Using the European Space Organization's HARPS instrument, astronomers already discovered a planet orbiting Alpha Centauri B. Then on Aug. 24, 2016, astronomers announced the intriguing discovery of a nearly Earth-sized planet in the habitable zone orbiting the star Proxima Centauri.